If you’ve taken a ride in San Francisco lately, there’s a good chance there was a passenger in the trunk — a package! For the past six months, we’ve been working with leading companies in e-commerce, hot food, flowers and groceries to provide same-day delivery of thousands of packages. By combining people and packages, Sidecar offers companies same-day delivery at prices that are 80% cheaper than traditional services, and cuts delivery times in half. We’re seeing explosive growth with same-day delivery already representing 10% of our ride volume in San Francisco. Today, we’re excited to announce we’re expanding our same-day delivery service nationwide. Same-day delivery will represent half of our business by the end of 2015. Our vision is that one day any business will be able to take an order and get it to the customer in an hour, and Sidecar will be the service that powers this capability. We’ve figured out the fastest and lowest cost same-day delivery approach and it’s a win for e-commerce companies, drivers and riders. Sidecar Deliveries makes the cost of same-day delivery dramatically cheaper for companies who integrate with our API — up to 1/5 the price of traditional shippers and cuts the delivery time in half. This unique combination of people and packages makes shipping so affordable, same-day delivery is now accessible for large and small businesses alike. Sidecar Deliveries is also a big win for drivers because their time is better utilized and they are busier for longer periods of time. 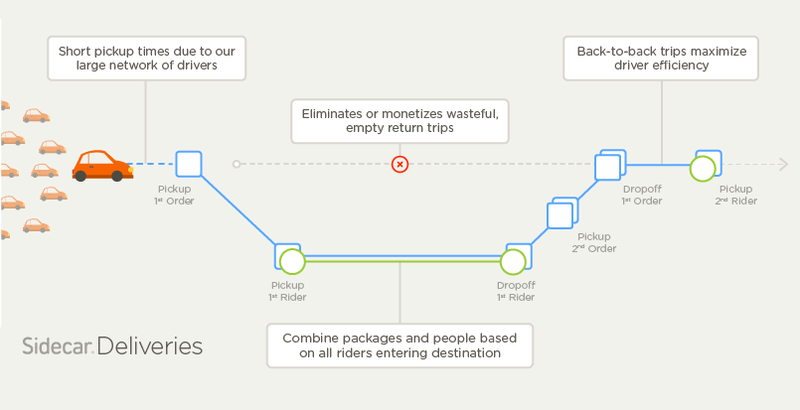 During our test period, Sidecar drivers earned 75% more when they delivered both people and packages. Riders also reap the benefits of this people and packages combo because there will be more drivers available, lower wait times and even lower prices. By integrating delivery with ridesharing and our large network of drivers, we’ve created the fastest, most affordable, seamless and scalable same-day delivery solution for e-commerce companies. By offering delivery as a service, e-commerce companies are able to outsource the cost and logistics of delivery to us so they can focus on their business and customers. Our partners are already seeing the impact the combination of people and packages for delivery has on their business. Popular online ordering service EAT24, one of our pilot partners, reported Sidecar reduced delivery time by almost half. EAT24’s restaurants saw double the revenue when our drivers served them. Sidecar Deliveries is already successfully operating in San Francisco. In the next couple of months we’ll roll the service out nationwide. If you’re an e-commerce company interested in working with Sidecar Deliveries you can sign up and learn more on our Delivery page. See what Sidecar investor Fred Wilson of Union Square Ventures had to say about the ridesharing market innovation cycle on his blog this morning. Our vision is that every business, large or small, will have the ability to offer same day delivery because they can outsource the cost and logistics to us. We’re on our way.